Thank you for all who came to the meetup and shared their stories and tips with the group. For those who were unable come to the meetup, here is a compilation of our shared insights and recommendations. I have categorised them for convenience. Did you know you can use your library card to borrow audiobooks and ebooks via your local library membership? The Stonnington Libraries use an app called Borrowbox where you can sign in with your library details. P.S. Someone mentioned that interlibrary loans will now have a fee of three dollars. Order those interlibrary books before they get expensive. Get locally grown (& imperfect produce) from Ceres. After watching War on Waste people were interested in finding a different source for their groceries besides the major supermarket chains. An alternative if you are in Melbourne is Ceres Fair Food. Ceres Fair Food is an online grocer and a carbon neutral food delivery service. They support local farmers and local communities and the produce is always fresh and delicious. Looking for a better butcher? Try Cherry Tree Organics. They are organic butcher delivering organic meat straight from the farmer. You can visit their online shop and have your meat delivered straight to your door. There is also Kenny’s in Hawthorn which was recommended at the Meetup. Don’t have a composting bin? Try Richmond Market on Gledhil street. A meetup member said that the market has compost bins available to the public. The bins get taken to farms and get turned into compost. Also, Victoria Market has a green waste recycling bins that are open to the general public as well as vendors. Request to the community: let’s write to other markets to ask if they can make composting available. Want to monitor your spending? Bla Bla Car was recommended by a meetup member who used it in Spain. However, the carpooling service only available in Europe at the moment. Confused on where to go for ethical fashion? Download Good On You. It’s an app that has ethical ratings for brands so consumers can shop with brands that has the same values as them. Customers can also send a compliment or a complaint to brands using the app. I think it is a good tool for having our voices heard by brands. A book for those who want sort out their finances and get their head around things like Super. It’s especially fantastic for families, couples or friends as the book is divided into little exercises to be done as a pair. Great for when one person is more into finance stuff than the other. This makes talking about money with your partner/family much easier. You can also do it on your own too. Another book that was mentioned was on the topic of finance and economics. This book look like a book for those who don’t know much about economics and wants to see how economics affect our day to day life and the wider world that we live in. The movement of zero waste overlaps a lot with the idea of minimalism. Simplicious by Sarah Wilson is a handy guide for those who are interested in reducing their waste and reusing more. Many of you may already know about the Minimalists blog but did you know that they had a podcast? Their podcast is weekly and you can subscribe to them via Itunes as well other podcast streaming services. On ABC iView until 9:33pm on 18 Jan 2018. Craig Reucassel known from The Chaser’s War on Everything hosts a three part series on waste in Australia delving into how much waste we produce and what we can do about it. It’s informative, practical and funny. Definitely worth watching it with your family and friend as a night of edutainment. Do you know whether takeaway coffee cups are recyclable or not? You’ll find out on the show! Is there a tiny/minimalist home rental service/website/app? Is there a local tool/utility sharing service similar to toy libraries? Is there a zero waste challenge similar to the Minimalist Game? Don’t force other people into minimalism. Replace FOMO (aka Fear of Missing Out) with JOMO (aka Joy of Missing Out). We want to live the good life, although the definition of the good life varies from person to person. My idea of the good life is a life that is meaningful, where I am not chasing happiness but contentment. In this trial and error minimalism helps me. I add and subtract ideas, habits, and objects depending whether they add value to my life, or just clutter it. One aspect of my life that needs an edit is my reliance on technology. In our modern life, we have an ever-growing relationship with technology. We use it to text, find dates, friend new acquaintances, read, watch, work and so much more. Our enthusiasm towards our devices makes it easy gloss over its negative effects. Maybe you have read about how our relationship with technology is affecting us. Being always connected can make us trapped in a stream of never-ending information. Too much light exposure from our devices disrupts our natural sleep cycles. Looking for more on the topic I have recently come across a book by Sherry Turkle, an MIT professor. The book, ‘Reclaiming Conversation: The Power of Talk in a Digital Age’, delves into how much is at stake when we spend too much time communicating through our devices. This book makes the case for conversation, and shows how it is integral for developing empathy, relationships, education, business, even democracy. This a great book and I can’t recommend it enough. I have been talking about it almost nonstop for the last month. Here is a brief summary of the book (hope you can find a copy in the bookstore or at the library). Turkle says that, due to our desire to be always connected, we have traded conversation for mere connection. I agree with her. We have a physiological vulnerability for seeking out newness. That's why we like to scroll through our feeds. We want to stay connected because we are scared of boredom. We want to multitask. Boredom has become something to avoid, and we forget (or never realise in the first place) that it is a gateway to self-reflection and creativity. According to Turkle, we are also afraid of having face-to-face conversations. Mainly, because we have forgotten how to. Those of us old enough to have grown up before the age of online conversations are losing our in-person conversational skills as we practice them less and less. The rest have grown up without role models to show them how to converse. We may be having conversations online but they are only second-rate versions of the conversations we could be having. We avoid conversations, partly because we are afraid of making mistakes. Why reveal your imperfect self when you can edit yourself to perfection in a text or email? We fear we might not be accepted as who we are if we do. As we have less conversations is we lose what humanises us: empathy. Through conversation, we learn to understand each other not just through words but also through body language. Children compete with devices at home. When they fail to divert their parents’ attention from their phones, they retreat to their own. Parents don't have the attention span to focus on their children. Families lose dinnertime conversations, a building block to building closeness and openness. Friends put phones on tables at outings. Friends don’t realise that this keeps the talk small and trivial. People don’t want to open up when they feel/ know that they will be interrupted by a phone. Friendships stay small and transactional. Are you more entertaining than my phone? What can you give me? Partners are not satisfied with their relationship. With online dating, millions of other profiles are available. Why try to work through problems and complexities when you can just swipe next. The search for “the one” never ends. Looking for love becomes gamified. Teachers wonder why their students don’t seem to care about each other’s feelings. Too much screen time has left children not knowing how to read other people's faces and body language. They don’t understand what other’s feel and they don’t care. They also can’t pay attention for long enough to understand a complex idea. In the office, colleagues are too busy multitasking or replying to emails and chats. They are too busy to focus and to develop a relationship with each other as well as clients. With no real conversation, employees and clients change companies as they feel no real commitment. Commitment, productivity, and the bottom line suffer. On social media we are as vocal as we were ever on issues but we don’t get deep enough on topics. We block people who have different opinions to us instead of communicating to understand each other. We become insulated only with people and ideas that conform to what we believe. In politics it is the same. Politicians share what their followers will agree with when we really need conversations that address our challenges and conflicts. Seeking solitude and self-reflection have become something to avoid. In our downtime we see loneliness as a problem, which we rely on technology to solve. When we go on social media we embrace the idea of “I share, therefore I am”. We rely on other people to give us a sense of self. I highly recommend this book. There are so many anecdotes and research to back how conversation is something we need to focus on. Conversation, with self and others, is what makes us understand ourselves and each other best. Everything else pales in comparison. Detach from your phone. Remember that your phone is not just an accessory, it is a powerful device that can distract you from what is important. Slow down. Make space for alone time. Look forward to being bored. Turkle suggests that you should try the seven-minute rule. Stick with the conversation for seven minutes before you break out your phone, even though you think it is getting boring. This also applies to when you are alone. Protect your time. Protect your creativity. Set your own agenda instead of trying to reply to all your emails and messages. Do what is important first. Create sacred space for conversation. Make space for conversation during family dinners, in your car, or at the park. Design your environment to protect yourself from unnecessary interruption. Pay attention to your thoughts and the real people that you live and work with. Do one thing at a time. Multitasking only makes you feel in control and productive but in every aspect of life it decreases performance and increases stress. Be vulnerable, have difficult conversations. Being vulnerable to talk without script is how you allow others to get to know yourself. If you meet new people and only show them the perfectly crafted version of you, that is not all of you. Talk to people you don’t agree with. In order to solve the challenges we all face as a community we need to talk to others. We can’t come up with a solution if we refuse to listen and understand each other. Turkle mentions a study that showed that people use don’t like discussing things that their followers might dislike. And social media users are less willing than non-users to discuss their views off-line. This life of no conflict may be friction free but we risk not learning anything new. When was the last time you talked with someone about your life and received the personal attention you deserve? It’s rare for anyone to get an hour to work on their life goals with a trained professional. As your coach, I create a supportive environment that will enable you to achieve your goals. I work with my clients to help them make lifestyle changes that make them feel supported during a transformative time in their life to produce real and lasting results. Have you ever received good advice that you were unable to follow? Have you ever looked for advice online but found it to be unsustainable? Have you ever wanted something in your life, but found you couldn’t achieve it alone? I will provide ongoing support and guidance as you set goals and make sustainable changes that improve your health and happiness. Together we’ll work to reach your goals to help you be well, do good, and change the world in a way that is flexible, fun and free of denial. We will go through how to declutter the physical, and the mental blocks that’s getting in the way of the life you want – a regret free life that is full of joy and contentment. I wrote a while ago about my dream home and my struggle to keep my dream as I wished. My dream home is small, efficient and lovely. Besides the general idea of being small, I don’t know what details I am looking for in my small home. As a result, I have been gathering inspiration for my dream minimalist home, so when the time comes I will be ready and know what I want. 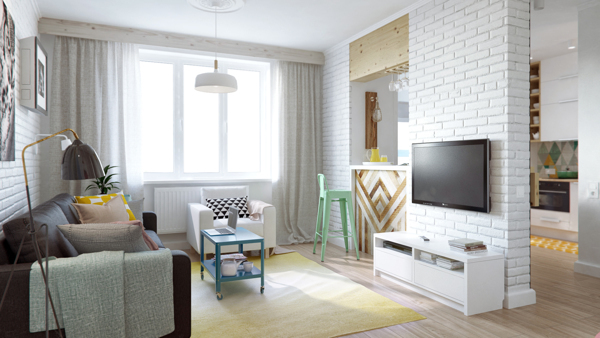 Today I wanted to share with you a small apartment that is full of life and functionality. 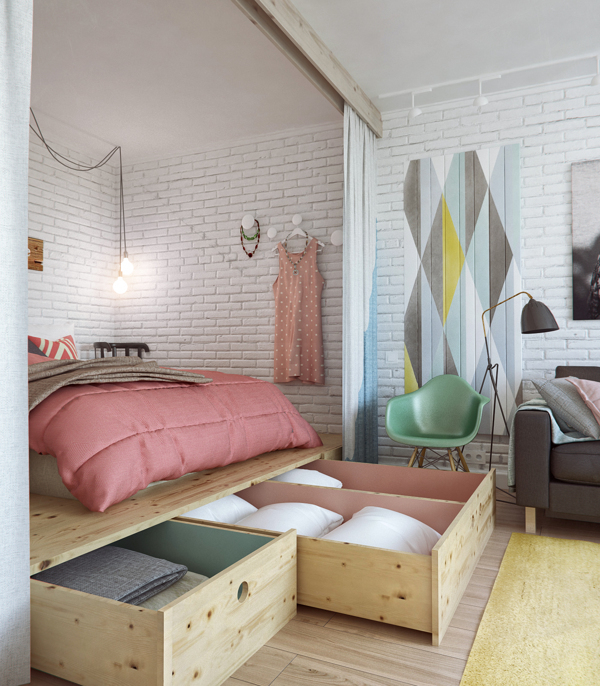 The apartment ( found on Behance) is located in Moscow, Russia and is only 45 square metres which is 484 square feet. I love how bright and spacious the kitchen feels. The blackboard/cupboard is my favourite. Instead of the television, I would have another sofa in the living room. In the middle I would have a small container of board games. With good quality noise cancelling curtains the bedroom and the living room will be properly sonically divided. Storage underneath the bed for spare pillows and linens. A small built in closet for my capsule wardrobe. A sitting area with a folding table in the balcony is another great idea. Underneath them there is more storage, too! On the opposite side of the balcony there is a not small bookshelf. Built in shelving in the bathroom. I love the scrabble tiles and honeycomb tiled floor. I have been in many homes. Most were large and few were little. Maybe it is the same for you. Because of this, we end up with the mainstream idea of what one’s home should be like. Luckily for us, in this information age we just have to search for what we want and we can easily find it. For more small home inspiration follow me on Instagram. Ffffff! I can't believe I just broke this recently flowering orchid after I waiting a year trying to regrow it! Ffgggggggg! Aah, diy pizza a home.